The chart above is of the S&P 500 futures contract, daily close prices, for the past year (ending with the current price today, 4 June 2014, as of the time of this blog post). The pink/yellow/green lines in the price pane are 100-day, 200-day, and 300-day moving averages of price. In the next pane we have daily volume. Notice how in the circled area the volume is significantly lower than average. Below that we have an RSI (Relative Strength Index) indicator. This is an oscillating indicator, meaning that the value is always between 0 and 100. 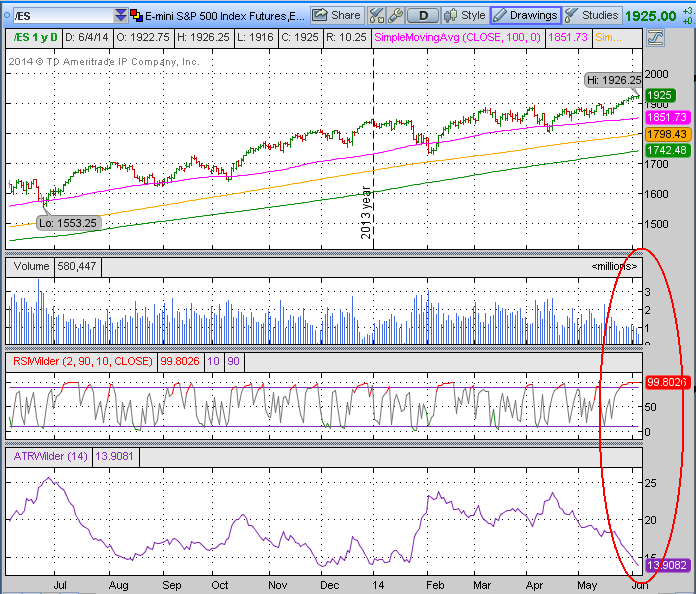 The purple horizontal lines through this oscillator pane are the oversold (lower) and overbought (higher) levels. Basically, a trader uses this graph to see if the futures contract has been increasing or decreasing in price lately. If it has been going up a lot, it can be argued that it's a good time to sell, and vice versa. As with any indicator, fortunes have been lost trading blindly along with its output. One has to treat it like another voice in the committee. In the bottom pane, we have an ATR (Average True Range) indicator. This is a simplified measure of volatility: the value of the True Range as a moving average over 14 days. The higher the ATR, the higher the day-to-day volatility. I don't think I have ever seen the price action, the volume, and two unrelated indicators line up like this before. Indicating how healthy and bullish the market is?